All of our hand turned rolling pins are made with select, solid hardwoods. Vermont Rolling Pins believes that as you use the best ingredients in your baking and pasta making, so our rolling pins should be made with the finest woods. All of our woods are sustainably harvested and are from a Vermont millworker. Please choose a favorite hardwood: cherry, maple or walnut. Below are picture samples of the woods and a brief description of the color of each wood. Each wood was chosen by Vermont Rolling Pins for its decorative and utilitarian qualities. Cherry has a tight grain and is resistant to warping. The color varies from pale creamy-pink to a mid coppery-brown. It will darken overtime to a rich, deep reddish brown. Hard maple resists abrasion; it is strong and heavy. The color varies from white cream to a tan hue with mixes of reddish brown. Walnut has a hard and tightly dense grain, holding up to abuse well. The color ranges from a light gray-brown to a dark chocolate or purplish-black. 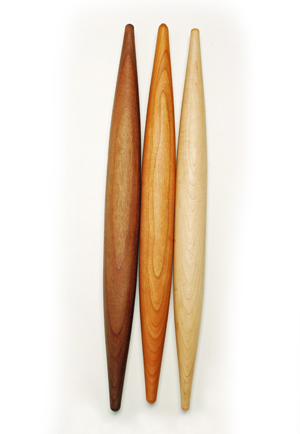 Our handmade wooden rolling pins are perfect for everyday kitchen use and for displaying. The French rolling pins pictured above from left to right.